Different people call it by different names – Palapanas, Neerpanas, jeev kadgi to name a few. 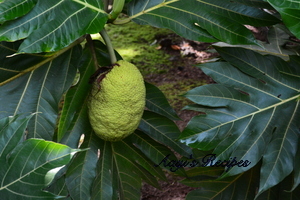 Many years ago, we had a long discussion about Konkani name of breadfruit. When I visited India this time, our tree was full of beautiful breadfruits. My parents were very happy that I visited during that time and I could enjoy one of my childhood favorites. They tell me that they have kept this tree mainly because of me. I also saw lot of tiny breadfruits getting sold in the market. Aayi had prepared a huge batch of chips for me. 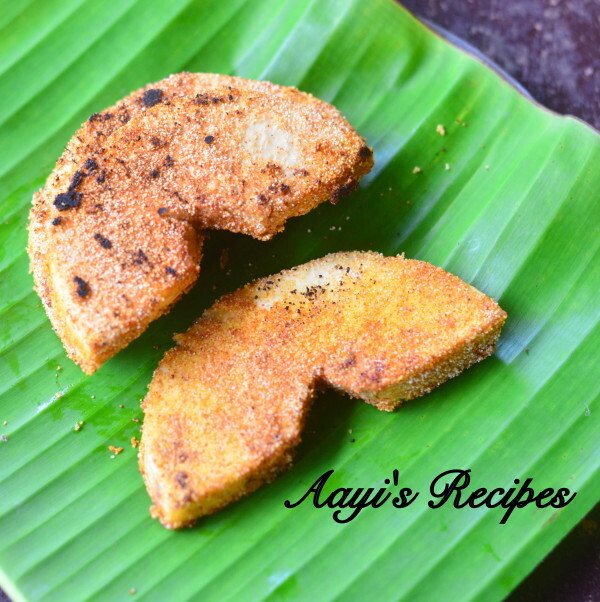 She also prepared the delicious randayi. But my favorite has to be the phodi. Fresh breadfruits make the best phodis. 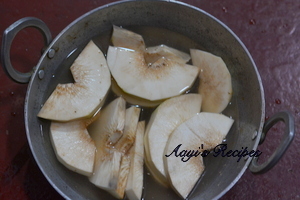 Cut breadfruit put in water. Apply salt, turmeric and asafoetida to pieces. Roll the pieces in rava and shallow fry. One of the most popular items on the menu in North Kanara during the rainy season are these shallow fried phodis prepared with fresh breadfruits. Remove the green skin and inner most hard white part of breadfruit. Cut the edible part into pieces(refer pictures). Put the pieces in water while cutting them. 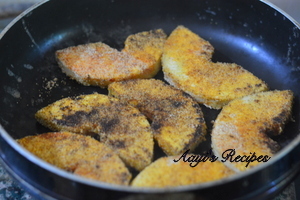 Mix pieces with asafoetida, turmeric powder, salt, tamarind juice. Heat a tava and apply little oil to it. 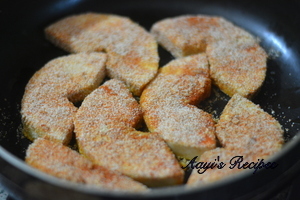 Mix rava with chilli powder and little salt. 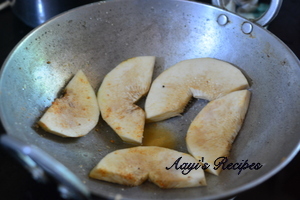 Apply it on all sides of breadfruit pieces and shallow fry on the tava. After few minutes, turn them upside down. Check the phodis after few minutes by poking them with a knife/spoon. If they are still not done, sprinkle some water, cover and cook for another 5-10mins. Oh My! These look so yummy! I can just imagine that how delectable they will taste when served with rice and dal. Yum! I am fonder of besan pakodas but if I am able to lay my hands on this fruit, I am definitely trying out this recipe.